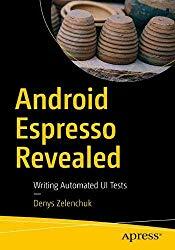 Write Android user interface (UI) tests using Google Espresso for Android. You’ll cover all the major topics of writing functional UI automated tests using the Espresso testing framework, including different ways of running automated tests, architecting test projects in an easy and maintainable way, and using tools which help to implement automated tests with less effort. Android Espresso Revealed explains the basics of using Espresso to write automated UI tests, and how to customize the tool for advanced functionality. The author provides examples in both Java and Kotlin as used in the Android SDK, and includes network operations, accessibility, supervised monkey tests, and more.What You Will LearnWrite Espresso tests with both Kotlin and JavaTest web views inside application under testUse Espresso to set up test devices or emulators to minimize test flakiness and run tests in Firebase cloudVerify and stub intents with IntentMatchersTest notifications or operate on third-party apps during Espresso test execution.Apply the Screen Object approach to the test project to reduce maintenance effortImplement supervised pseudo monkey tests using Espresso and UIAutomatorWho This Book Is ForEngineers with medium and advanced knowledge in Android test automation. Engineers with basic development or test automation experience can benefit from it as well.